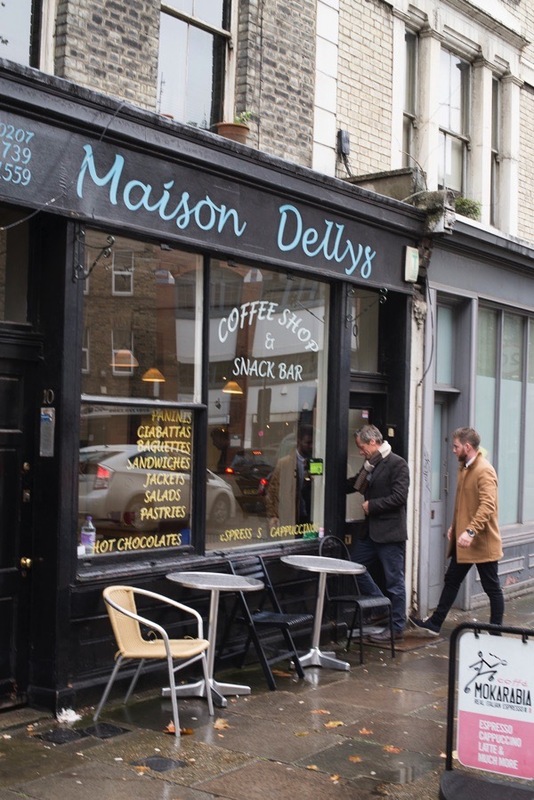 Maison Dellys is a small cafe in an old terrace beside the triangle of trees where Columbia Rd meets the Hackney Rd. 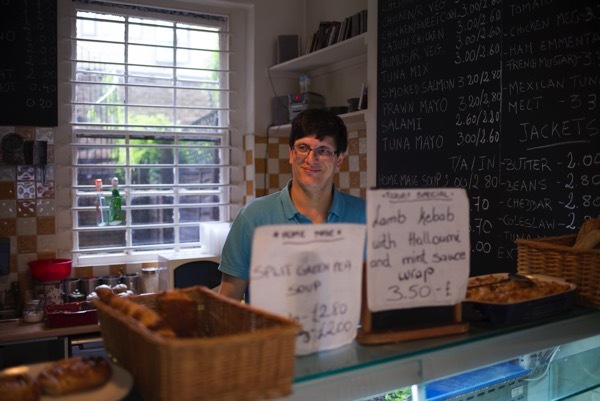 In this quiet spot, you may rely upon a peaceful cup of tea and a snack at an affordable price – a commodity that grows increasingly scarce in this part of the East End. 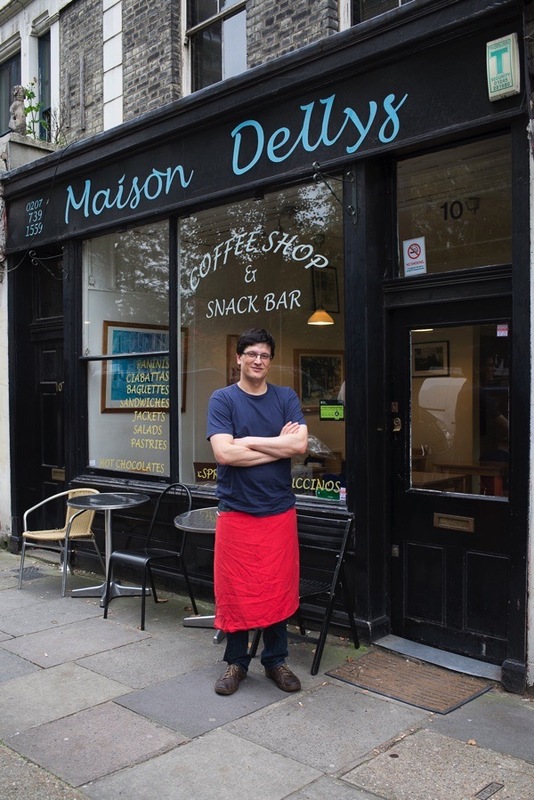 Farid Djebrouni opened his cafe eleven years ago and has worked hard to build up a significant clientele and reputation, but next week on Friday 30th October Maison Dellys will be closing forever in the face of a rent increase from £11,000 to £27,000 a year. Rather than this event go unacknowledged, Contributing Photographer Sarah Ainslie & I went round for a chat with Farid this week to offer him our moral support and thank him for the invaluable service he has provided to the community over the last decade in creating a friendly focus for those who live and work locally. 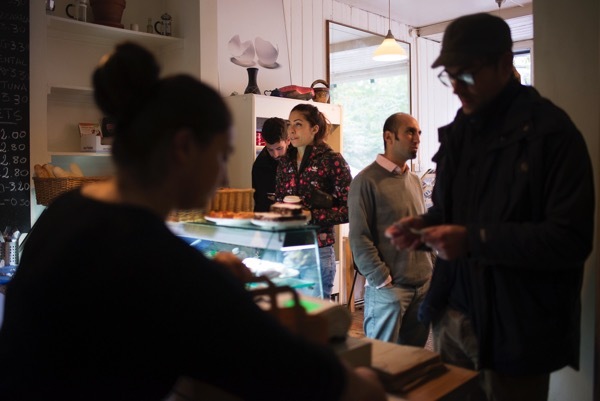 “When I came here eleven years ago, I liked the look of this cafe with the big glass window and the trees outside. I was a nurse before I opened Maison Dellys. My father died when I was a child and I spent a lot of time around hospitals, so when I grew up I chose to become a nurse myself and take care of people. But after three years, I realised I wasn’t cut out for it and I had another love which was cooking so I decided to do this. I was born in Nigeria and my wife and I used to live in Hackney, but then we moved to Barking because it was the closest we could afford to buy a place. My wife works for an investment bank in the City, she makes the money for them. I get up each morning at five-fifteen. You get used to it but you have to be disciplined and go to bed early, which is difficult for me because I like to stay up late. I open every weekday from seven until four and I have one employee who works with me. I cook pasta and lasagna every day, one vegetarian and one meat. I make the sauces and bake the pastries first thing every day when I arrive. Sometimes, I have a line outside when I open at seven and its very busy between midday and two, but you don’t see anyone after three. I like it very much although sometimes it can be a bit stressful when people are demanding. I look upon it as a challenge, to provide good food for people with nice service and make them comfortable. I recognise all my customers and know everyone by name, it’s like a small club. People feel at home. We get a wide range of customers who work nearby, from drug dealers to famous artists and architects, and they all mix together. My landlord owns a shop round the corner too and their rent has gone up, so they increased mine from £11,000 to £27,000 a year. We tried to negotiate a new five year lease and they offered to come down to £25,000 a year. Nobody can afford to pay so much. Under my license, I only have limited hours and I can’t open at evenings or weekends. In eleven years, I’ve seen the area change. When I came here there weren’t any coffee shops and Shoreditch High St was empty. The big boys are coming in now who will throw away £200,000 just have a presence in this area, and a lot of my customers who are designers and artists are moving out because they can’t afford the rent either. I want to take a bit of time off until the of the year to clear my head and then I’ll look for a cafe further east in January. Otherwise, I’ll give up and try to get a job and become a Monday to Friday person. What I will miss will be the people I’ve met here. I’ve been fortunate, London is a great city but the people in the East End have the biggest heart. I heard about the riot on Brick Lane and I don’t believe in violence but I understand why people are angry. So many are going out of business round here but the Mayor isn’t doing anything about it. It’s a bit scary. A tall man with a sympathetic modest demeanour, Farid has become a widely-respected personality in this corner of Shoreditch in recent years. You have until next Friday 30th October to pay him a call and give Maison Dellys a bumper last week in business. There will be also be a party on Thursday 29th October from 5:30pm for regulars and well-wishers. Sad – but very much appreciate the sympathetic eulogy. These passings are to be mourn – like humans, pets, way of life which was good for the soul. Wishing Farid all the best. This is tragic. It sounds as if the whole area is being killed off for any but the over-paid and over-rich. I wish I knew what one could do about it – apart, that is, from supporting political groups that demand change away from this sort of thing (which I do) and ignoring the pressure from the Establishment who try to make fun of them. All very sad really! No doubts it will be replaced by another dull brand. I wish Farid and his family well. Such a shame this is happening to local businesses. The changes in this part of East London are not always for the best. You sound great. I’ll try and get to your cafe before you close to wish you luck in person. Who is the landlord? There should be a campaign to name and shame landlords who demand such outrageous rent increases. It is pure greed. We need a system as in Germany where, once a rent is set by mutual agreement, future increases will be limited in relation to a measure of inflation such as CPI or RPI. What a crime – it is happening everywhere. In my little town we have just lost a really useful shop still processing photographs, doing wonderful little printing and reproduction jobs for people and following a 50% rent hike we are now getting a cruise wear shop. Another one of your pieces highlighting how honest, hardworking Londoners are being priced out of business by unregulated market forces. It paints a depressing picture and one compounded yesterday by a piece I read in the Guardian about a London event where business interests are putting on seminars for councillors and housing associations on releasing social housing as prime real estate. You are a voice for ordinary people. A small voice in the wilderness perhaps but a necessary one in these heartless times. Such a shame this lovely little cafe has to close with this ridiculous rent increase. Thanks for highlighting this and something needs to be done to protect little independent businesses in this part of London. It’s very sad that landlords can charge exorbitant amount thereby forcing tenants out. The same thing has happened to my daughter Romilly and I. Everywhere one goes in East London the big businesses follow and make it difficult for small fry to survive. This kills the individuality of an area. Thank you for this article. My sympathies to Maison Delyss. This is very sad. I hope Farid can find a great new cheaper area to set up in. His cafe looks wonderful. Maybe he could look to Southeast London instead, which should be easy for his wife to get to work. I am in SE15 which is still changing…. So sad to read about another small business going. Wishing Farid the best of luck on his next enterprise. Tragic sign of the times. I hope he finds another niche somewhere kinder. In the old days business rates and rent control worked to protect old and established businesses. This government has no interest in small business, as you can see. They favour only their own public school wealthy ilk: landowners. It stinks. Who will vote Tory next time round? Only fools unless they are landowners. The economy is clearly NOT safe in their hands when even a good coffee shop cannot remain open. Rent hikes like that will suffocate everything lively in London. What is it they say about not having a voice? I can’t quite recall but I know it’s not good. Thank you Gentle Author for giving Farid Djebrouni a voice, and by extension myself one too. My rent rose similarly. In slow years I had 7 employees and 15 in peaky boomers, but I closed up shop when the rent quadrupled in 15 years. Now my staff are employed elsewhere [x4], emigrated [x5] or unemployed [x6]. Me? I lay low these days, when once I trained a generation of craftsmen. I heard a Libor crook refer to me as a ‘drain on society’…. One by one they go like ninepins – so depressing. This wouldn’t happen in Denmark, where small local businesses such as this are valued and fully supported. The return of rent control is the only answer. recognize a cause. Just a thought! I despair at the way ordinary people, working hard to make a living for themselves and their families, are trodden on in this way. Go well, Farid. Best wishes for future success. of luck in the future. So sad. Greed is ruining so much of what is of real value to working people. Having a nice place for a cuppa where the owner serves you is on the way out. High rents (commercial and residential) are ruining so many cities. Look at San Francisco. London has always been my favorite city, but each visit it becomes becomes harder and harder to handle all of the new development and higher prices. I so admire the spirit of East London expressed in this blog. I am saddened with each loss to the community infrastructure and applaud every victory for keeping history and traditions and common sense alive. This is S*** I suffered similar. Tragic and Boris and David do nothing. 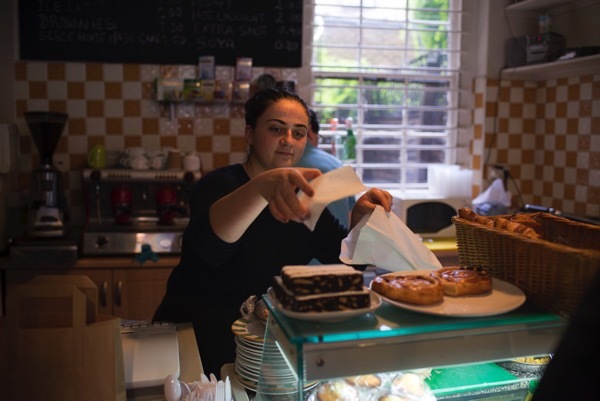 This is a lovely but rather sad story – the corporate gentrification of East London. My youngest son talked me through similar as we walked up Shoreditch High Street the other day and stumbled across an “EAT” coffee house. No wonder the independents are being moved on. Why give up on this area Farid ? don’t waste time worrying about the ‘big boys’ F?$£ them, >fight back< forget moving East and looking for a new SHOP, why not apply for a STREET trading licence and set yourself up at the top of Sclater St, you can still trade Mon to Fri and being right next to Shoreditch station and the Box park shops you will be right in the thick of it, the council are issuing licences for food traders in this area and it would not need to cost you a fortune to get set up plus from then on your running costs would be only a fraction of your currant shop rent and you would be less than a mile away from where you shop is now, you may take less money at first but your cost's would be so much lower that you could still make a decent living, at least you would be keeping most of the money you make instead of passing it on to a landlord, I know people who are doing it already, why not give it some serious thought, I know it can work, these days for the small trader going BACK to the beginning is definitely the way FORWARD, if you know what I mean. 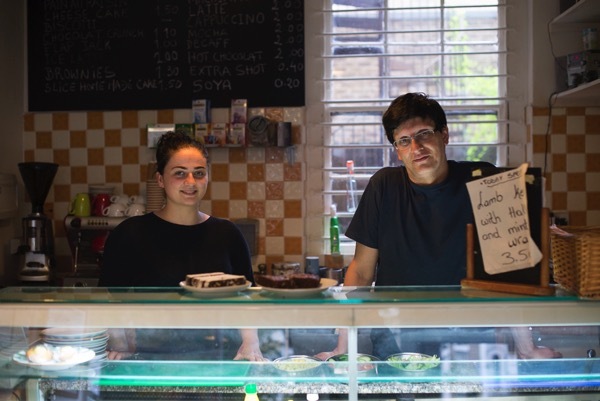 The sad irony is that by making his cafe a success, Farid and other traders like him have regenerated the area and made it attractive to investors and large corporations who are now pricing them out of the market. I wish him success for the future. It has been said if you want to know which part of a city is going to be the next growth area is to follow the artists. They need space that is not expense, by taking run down areas they can make it hip and attractive for others to move too, as is the case in Hoxton. This has happened in Berlin, which was known for being more radical and edgy but is now under pressure from commercial interests. Since the crash of 2008 a lot of money has been pumped into the world’s economy and much of this is looking for a safe home which will provide a decent return on investment. Unfortunately property in major cities such as London is proving attractive. How long this will last and whether it will continue after interest rates are raised remains to be seen. The main concern is the longer this situation continues the bigger the fall out at the next downturn in the economy will be. Don’t blame the landlord, he’s raising the rent to an astronomical level because HIS rent is being raised in the same outrageous way! The fat cats at the top of the heap are the ones responsible. It’s a rotten shame that good people like Farid and his family and customers are losing a simple, happy way of life to further enrich the filthy rich who want to run everybody off to build more highrise towers of flats that ordinary people can never afford. 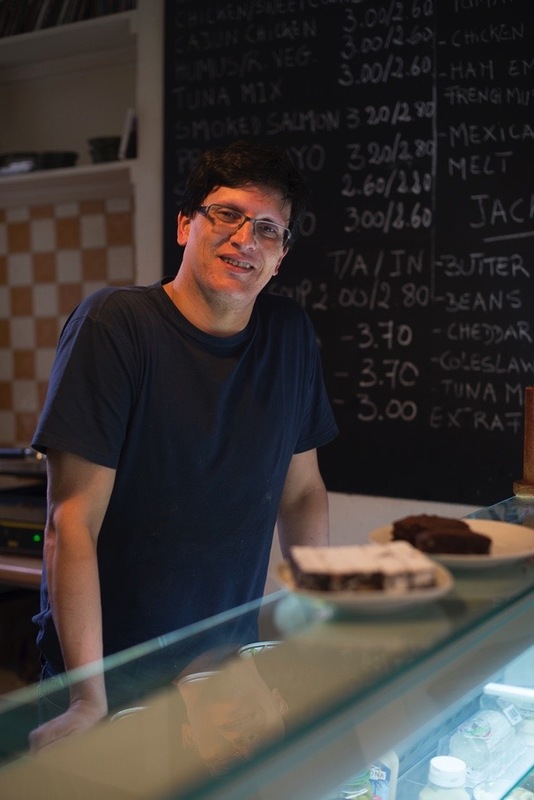 Farid, I wish you good luck in finding a new and affordable location for your café – wherever you and your family resettle, you’ll make the world a better place. Thanks for this piece. I’m so frustrated that we live in a country where market forces dictate the fate of brilliant and successful small businesses like this. 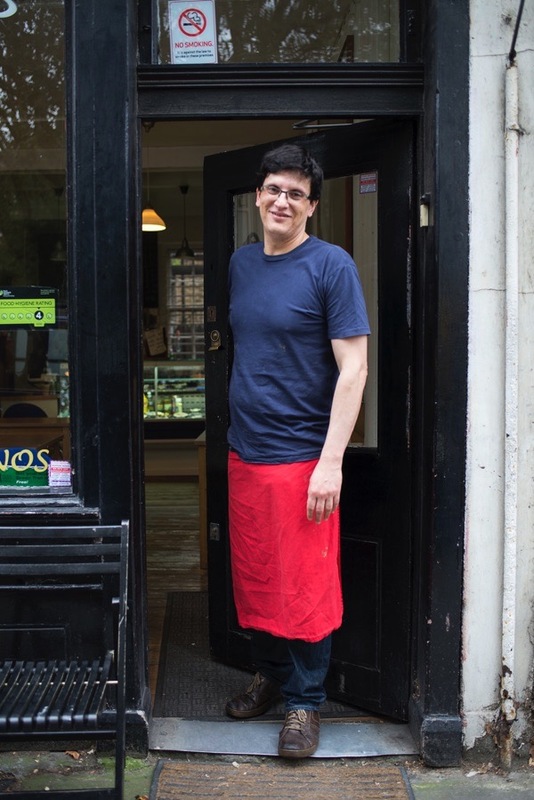 The dismantling of rent controls and support for small businesses is disastrous for people like Farid. Starting to lobby landlords is a good idea. No point blaming the government or gentrification of the area. The cafe is in itself a sign of the rise of the area socially. It is local people who choose to use the chains rather than local shops! I will try to go and say Goodbye. These are lovely people and in the end they will thrive, although perhaps not in monetary terms! This is such a sorry tale of what’s happening in London. When the ‘rich’ have taken over I hope they realise nothing of the culture and character of the area they’re buying into will remain. I live and work in Hackney and most of the neighbours around our Shoreditch studio when we moved in back in 2012, many of whom had been here over a decade, have completely changed. Thank you for this story and all the best to Farid. Keep us posted on future plans. Such sad times. This is a crime! An increase of more than double your yearly rent? It’s sickening. Where are our/your rights? Human rights! This also happens in the housing market. It’s ludicrous to think that we have to just accept this. I wish you and your family well. There’s nothing more to say except this is so sad. Don’t just blame the landlord – he’s operating in a property market that has been shamelessly inflated into another bubble by a government that is steeped in ‘free’ market economics. This happens all the time here in the States in every major city: New York, Boston, San Francisco, Chicago, LA etc etc. I hope he can reopen in a new location and to be honest: unless a small brick and mortar business sets out to eventually buy and own their building they will always be at the mercy of a landlord. I hope he can find a property to buy because then he will truly have buisness assets. This is so sad and such a great loss to the community….thank you gentle author for shining a light on this and so many other important local issues. Farid, you have been a great person to know, and extremely helpful and obliging to us all at the hospital. You have always helped out at the last minute when I get on the phone to you and place orders. Nothing is too much for you. You have made a lot of friends over the 11 years here, and will be really missed by us all. Joel who is in India was sad to hear that you closing, and has fond memories of the Cajun chicken. Kathy will miss you too and the lunch time music. Reading this article makes me furious about the lack of support local businesses receive from politicians who make promises before they are elected. Farid you’re a top man and I’m sure better things are in store for you, we will definitely miss your food which mirrors your personality – humble and homely. Best wishes for the future mate! Went to say good bye not realising that I had been in this cafe a lot in the past when working at Mildmay quite a few years ago. 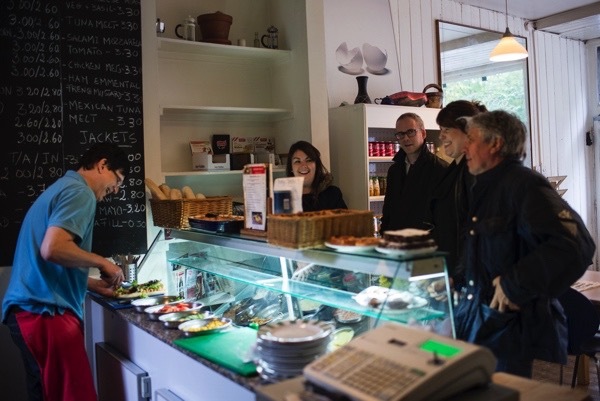 Might have had the last sandwich served on the 30th as it had been very busy before we arrived. Glad me and my friend made it just in time.